Last month, California adopted a new way of grading schools, also known as the LCFF Evaluation Rubric. This marked an end to an over-reliance on test scores as part of the No Child Left Behind era, and a new opportunity to #RedefineSchoolSuccess. The LCFF Rubric was a critical opportunity to put a spotlight on students who are often invisible in education, such as Black, Latinx, South East Asian, foster care, and LGBTQ students who are disproportionately affected by suspensions, chronic absence, and an unsupportive school climate. Recent state data shows that 194,000 students of color were suspended, and 1 in 3 students couldn’t name a single caring adult at school (California Department of Education). Data like this will now be visible across the state through the LCFF Rubric because of this student-led victory. 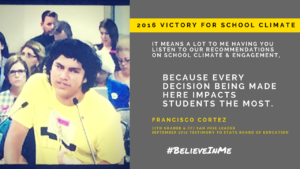 Over 400 students, parents and advocates mobilized to State Board of Education meetings, representing 25 organizations from across California. Students shared powerful stories about the impact of school climate on their education and collected 270 postcards to “save school climate”. Alliance for Boys & Men of Color, LCFF Equity Coalition, Public Advocates, Oakland Community Organization & PICO California, Fight Crime Invest in Kids, ACLU of California, Families in Schools, Fathers & Families of San Joaquin, InnerCity Struggle, Education Trust West, Children Now, EdVoice, Bay Area PLAN, Coleman Advocates, Santa Ana Building Healthy Communities, Community Coalition, Somos Mayfair, Promesa Boyle Heights, Public Counsel, Children’s Defense Fund, Lawyers’ Committee for Civil Rights of the San Francisco Bay Area, Bay Area Tutoring Association & CodeWritingKids.com, GSA Network, National Center for Youth Law, People Acting in Community Together, Youth Together, Forward Together, and Our Family Coalition.